The 510 Sundancer features large hull windows and graceful hull deck lines, an enclosed cockpit Sunroom with two retractable sunroofs and a pivoting double helm seat for enhanced sociability. The mid master indulges owners with new fabric and finish packages, and separate head and shower compartments. A gourmet galley and plush sofa round out the rewards in the main cabin in a naturally-lit, atrium type environment. Sea Ray & Red Dolphins Marine are winning team. 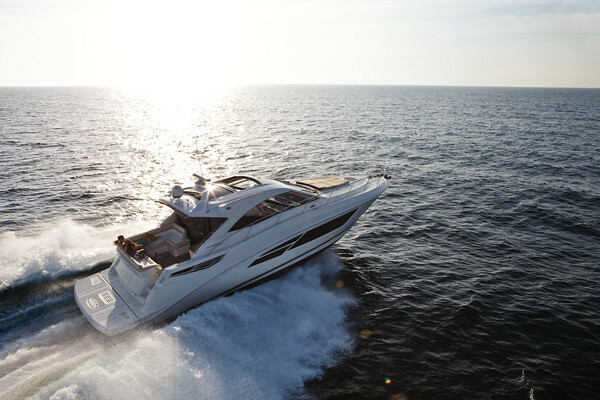 Your purchase is protected by the Sea Ray -best in class- warranty and our exclusive FREE preventive service program for 18 months including: Digital scanning, Travel, US Certified technicians, and all original lubes, filters for both engines, and grease for any Mercruiser, CMD, Cummins, CAT. Jose Maria Torra, Sea Ray Sales Director, Costa Rica.